In 2016 we celebrated the Euro 2016 football tournament and commemorated the centenary of the Battle of the Somme with a whole host of literacy activities. These included 16 writing activities to complement our Over the line 2016 instalment story, Over the Line 2016 These writing exercises are available exclusively to our Network members. 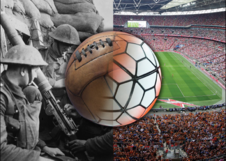 Other literacy resources relating to Euro 2016 and the Battle of the Somme including a literacy toolkit, can be downloaded from our Euro 16 resource page.